This piece is a "side-project" that I started in the middle of working on something else. I was working on a new sci-fi project and decided that an unused element would work nicely as an aurora. The scene was designed and rendered on my old Bucephalus workstation. This depiction/artwork will stand a test of time. The imagination and time spent on this piece one can only imagine. Good job Ryan. Wonderful as always! A side project? Unfortunately this is a side-effect of how Vue's camera works. When I compose a scene for 16:9 and then widen the angle to 48:9 the top and bottom of the frame are cut off. It's hard to describe, but there just isn't any way to both widen the frame AND keep the sky in frame. The long and short of it is that 3D programs get very wonky when you try to use absurdly wide frames. I had tried creating the multiscreen images first and then cropping back for the single-screen, but creating the scene is very difficult with the extra wide frame. Objects on the sides of the frame seem to stretch out and move in 3D space differently than they do at the center. I would have loved to include more of the aurora in this render but, essentially, the camera wouldn't let me. @Ryan: I really like this scene (it's one of your best recent ones), and I was looking forward to the multi-screen renders. I see you've added more chunks of ice to those (rather than taking any away), and that's fine by me; I quite like the iceberg(s). However, I'm disappointed to see that something seems to have gone wrong with the aurora borealis. It's kind of stretched out and gone all thin! 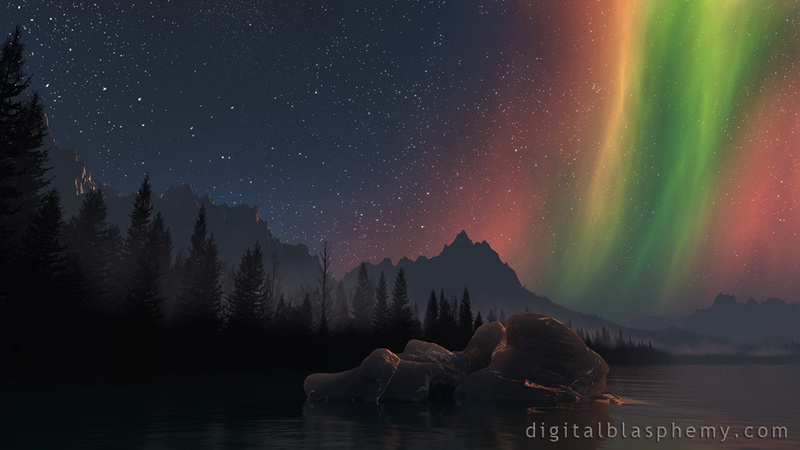 I was hoping for more aurora, not less, in the multi-screen renders, but it's fading away like a proverbial rainbow! 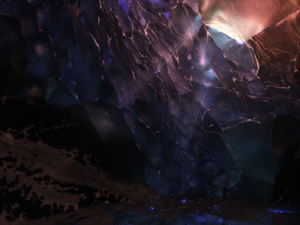 Compare the aurora in the original scene with that in the equivalent position in the dual-screen render. There's a whole world of difference! The original is beautiful and intense; the dual-screen one is limp and wishy-washy. What happened? Another problem is that I feel the left-hand end of the render starts too far over to the left. The left-hand screen in the dual-screen render is barely worth looking at, whilst the leftmost screen in the triple-screen render is almost entirely black! The whole viewpoint really needs to be shifted round to the right a bit, in both multi-screen renders, so that the leftmost screen in each set contains at least some interesting detail, rather than just the blackness of unlit trees! So I'm sorry that these multi-screens haven't turned out as well as usual… but I do hope you'll give them another go, because basically I think this is one of your best scenes in recent times, and it'd be a shame not to do it justice. Breathtaking! I just love the colors and how they contrast with the dark night sky. This piece is absolutely awesome! The aurora, the light off of the ice, the tree silhouettes, and the mountains and stars all come together beyond perfectly! Great work! "Need pickle jar version without blob in front"
Feedback is a gift. Keep up the great work. Howdy _ another amazing creation _ I can relate to having been in our Canadian North _ the lights are incredible especially during extremely cold weather you hear the crackle of the waves as they drift through the atmosphere. I love mountain scenery, this reminds me of vacations we would take as a family. Since they've passed away now. I so miss those times we had together. But so thankful that I've seen a lot of the country because of my father's love of being on the road and seeing the country and making sure we saw it too! I love the Northern Lights. I am happy to put this on my screens. I think the ice floe is a great addition. It gives the rest of the scene balance and allows the light to play off it in a realistic way. From the perspective we are looking at it, we cannot be sure it is a lake - might be a river! The floe could be a rogue floater that has traveled a long way to get to that point. Keep being amazing Ryan! I'm sorry for the folks who don't like it, but I wanted something in the foreground and this is what I settled on. "supposed to be a small ice floe"
You said it's supposed to be a small ice floe. And this is supposed to be a lake? Sorry, but I'm not sure I understand this from a reality aspect. There would be more ice in a lake, not a huge chunk just floating in the middle of no where. Sorry, but I don't like it. "Nice work, with a suggestion..."
Overall, very nice idea and execution. I was puzzled by the coloring of the "rocks" in the foreground. Then, I read some other reviews that mention these are ice formations. I've seen ice formations floating in the ocean off the coast of Alaska - they are not dark grey, even at night. They are white and reflect the light from the night shy, moon, etc. I think this image would be greatly improved if you made this correction. Having said that, love your work overall. Keep creating! "Lovely - multiscreen would be great"
I really like this one. Maybe the little iceberg in close proximity to the trees seems an odd juxtaposition, but that's of little consequence. Beautiful scene. This is one that I'd really like to see in multi-screen renders, because I'm sure there are other nice views that could be derived from it, even on my own single-monitor setup. In particular, I'd like a view turned a bit to the right, perhaps, with more of the aurora visible on it. In the current scene, the colourful sky is maybe just a bit too far off to the right; I'd like to be able to just turn my viewpoint to the right a little. But overall, a lovely scene. This and the recent Hyperborea are two of the best new scenes for ages! I like the "rainbow borealis" effect you used; I'm surprised no one else ever showed a borealis that way, as it seems a natural fit for artwork. I thought the rocks in the foreground looked more like giant-size salt crystals than anything else, based on their coloring and the "glaze" effect. But other than that, yeah, good work! This is one of my all-time favorites, Ryan. But I don't grok the rocks. Maybe a version without them? @Steve57, I would just go with 1600x1200 and set it to stretch/fill the screen. It's a gorgeous image, but I can't find the 1280 x 1024 image. Simply put and nothing more than... WOW! I love the soft colors in this. I've seen auroras when I'm in Alaska, and it's just like this dancing across the skies. I love the ice!! Thank you - this is just beautiful. "Going to be a great Tri-Screen"
Beautiful colors! Can't wait to see a tri-screen of this awesome image. Great colors... but the ROCKS need fixing!!! It almost looks like a mini iceberg... they need rock texture. Brings back memories of Canada where I use to live when I was young, Great render my friend, Awesome detail and Colour, love it. That looks much like what I've seen in the night sky here. I like it, although one of the rocks in the foreground looks like a sheep and for some reason it bothers me. It wouldn't bother me if it WAS a sheep. The background looks awesome. The glassy chunk of ice/rock (?) needs to go away. Love the Northern Lights. A very picturesque scene. This reminds me of my aurora trips to Fairbanks. Well done. Both two main desktop systems are multi-monitor setups. I have noticed that you are not making multi-monitor versions of your images available any more. Do you plan on resuming your multi-monitor images? Stretching your single-monitor images to across multiple monitors causes sinful damage to your images. As in outta the park! What a great vision this is and another virtual pat on the back. Excellent! Question: The streaks that appear in the star field in the upper left - are they intentional or an artifact from the render? "Another great one, but no multis"
This is another outstanding render (especially in terms of colouration and clarity), but alas, no multis. :( I've noticed a lot of renders lately that essentially don't get multiscreen versions. Cropping from larger versions seems to lose some of the original perspective. I hope that you will continue to support the multiscreen versions. The True North Proud & Free, baby! Woohoo! First one I've downloaded in years, thxs. Wow Ryan you outdid yourself on this render. I absolutely love it!!! The last two have been terrific!! True North brightened my day. Good work!